This is the predicament that faces public school teachers, who are already suffering from big pay cuts due to loan deductions, should they fail to settle their debts from Private Lending Institutions (PLIs). Teachers from Central Luzon trooped to the Professional Regulation Commission (PRC) on Friday to appeal the agency “not to take the side” of PLIs – particularly St. Bernadette Lending, among others – when it comes to settling their loans that have accumulated due to high interest rates. 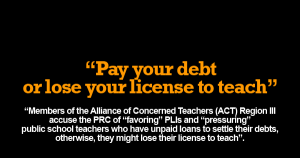 Members of the Alliance of Concerned Teachers (ACT) Region III accuse the PRC of “favoring” PLIs and “pressuring” public school teachers who have unpaid loans to settle their debts, otherwise, they might lose their license to teach. ACT Region III president Romly Clemente said PRC has been summoning teachers who have availed themselves of loans from PLIs to a series of mediation. 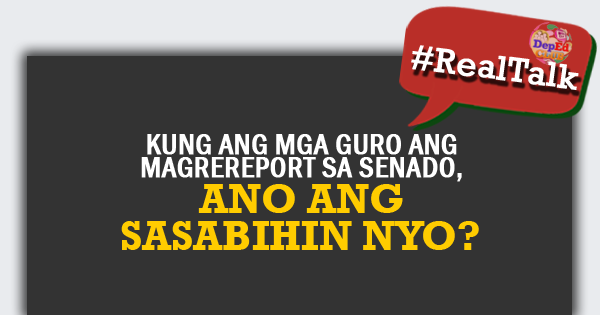 “Bakit ang PRC, isa-isangpinatatawag ang mga gurong may pagkakautang sa PLIs at kunwaring namamagitan (Why is the PRC calling teachers who have loans with PLIs one by one in an apparent effort to mediate)? Clemente alleged that when teachers attend the mediation in PRC, they are being forced to settle their unpaid loans with interests by asking them to sign documents and opening of checking accounts so they can issue blank checks. No PRC official could be reached immediately for comment. Public school teachers claim that among the reasons many of them tend to over-borrow money from PLIs is due to low salary. Thus, they have reiterated their call for the Department of Education (DepEd) to support their call for wage hike that will increase the entry level salary of public school teachers to P25,000 and P16,000 for non-teaching personnel. ACT Teachers Representatives Antonio Tinio and France Castro filed House Resolution No. 1342, seeking a congressional investigation on the legality of DO No. 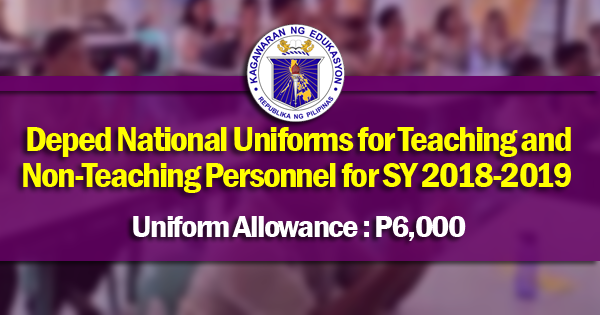 38, s. of 2017 which, according to them, “effectively reduced” the net take home pay (NTHP) of “about half of the teaching personnel and other employees of the Department” for the month of October – with the amounts ranging from P100 to P900. But DepEd maintained that this “predicament of teachers was not left unheard” as Education Secretary Leonor Briones promptly issued DepEd Order No. 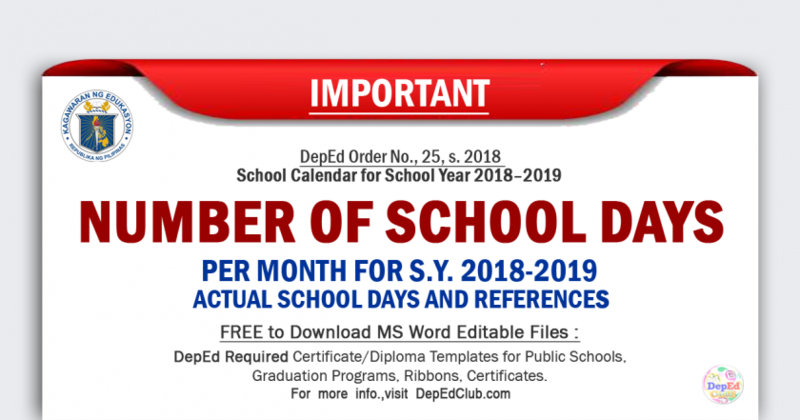 55, series 2017 (DO 55), or the “Revised Guidelines on the Implementation of P4,000 Net Take Home Pay for the Department of Education Personnel,” which now supersedes both DO 38 and DO 27 (Addendum to DepEd Order No. 12, s. 2017). The same priority, DepEd noted, is also accorded by DO 55 to payments for the Bureau of Internal Revenues (BIR) and the Philippine Health Insurance Corporation (PhilHealth). “The damage of over-borrowing on the lives of teachers and their families has been going on for years and it can no longer continue,” the DepEd said. “The Department is steadfast in its commitment to enable its personnel to truly reap the fruits of their hard work,” it added.